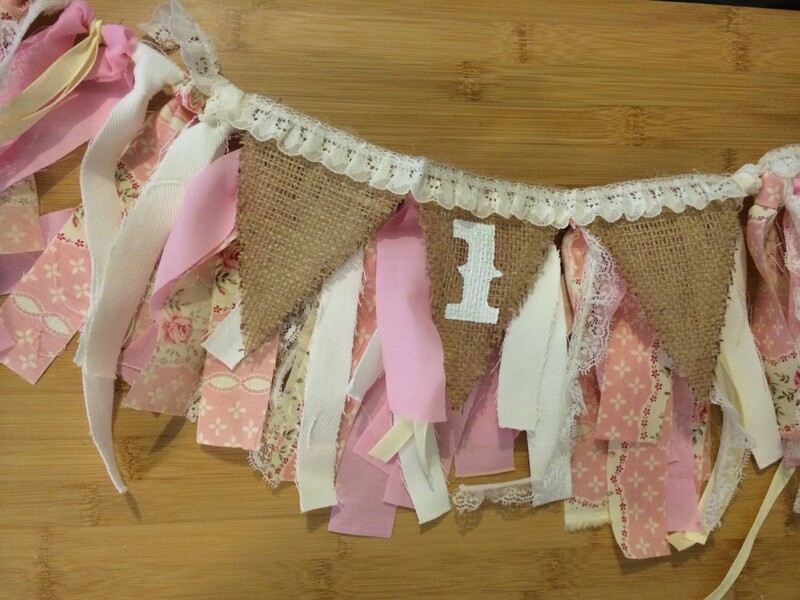 A very special 1 year old just celebrated her very first birthday. 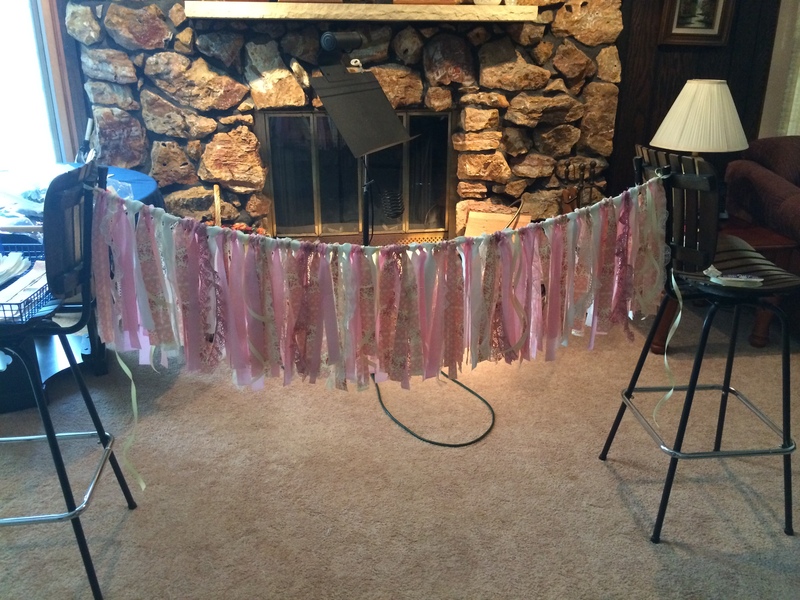 And because she is simply adorable, she needed a simply adorable birthday banner in her honor. When the munchkin’s aunt sent me this inspiration photo, I knew I was most definitely up for the job. The lucky lady is my best friend’s niece, Little Miss Sullivan. I’m not quite sure on the protocol for sharing pictures of other people’s children on the internet, so I’m just going to skip that. But trust me that she is absolutely beautiful! And she wore THIS dress. 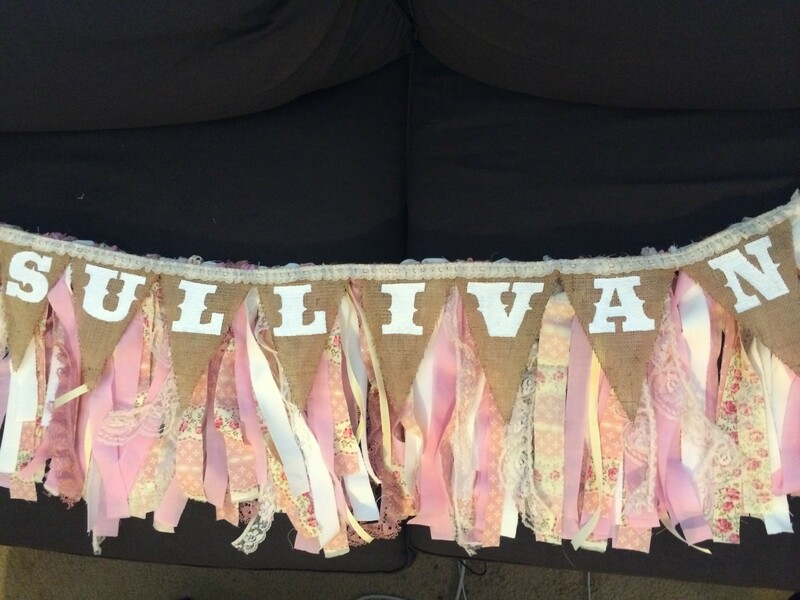 How could a 1 year old in THIS dress deserve anything less than the most perfect birthday banner ever? So I immediately recruited my mother and planned a trip home for the sole purpose of raiding her craft cabinet (do you have any idea how much lace costs?!). And in the meantime, I made a list of the material I’d need. 1/2 yard Floral Fabric – This was a doozy to track down the perfect floral fabric, but I found it Hobby Lobby. Once we had all our materials, we hopped right to it! 1. 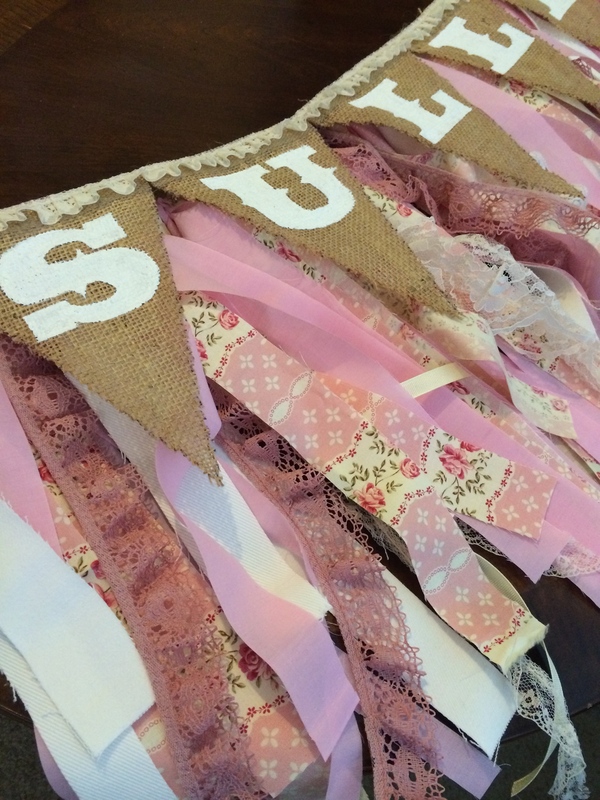 Start by cutting your fabric into strips about 1 inch wide by about 24 inches long. This part took the longest, honestly. 2. Then cut a long string of ivory ribbon and tie securely to 2 heavy objects. We used 2 bar stools. Then loop your strands to the ribbon! 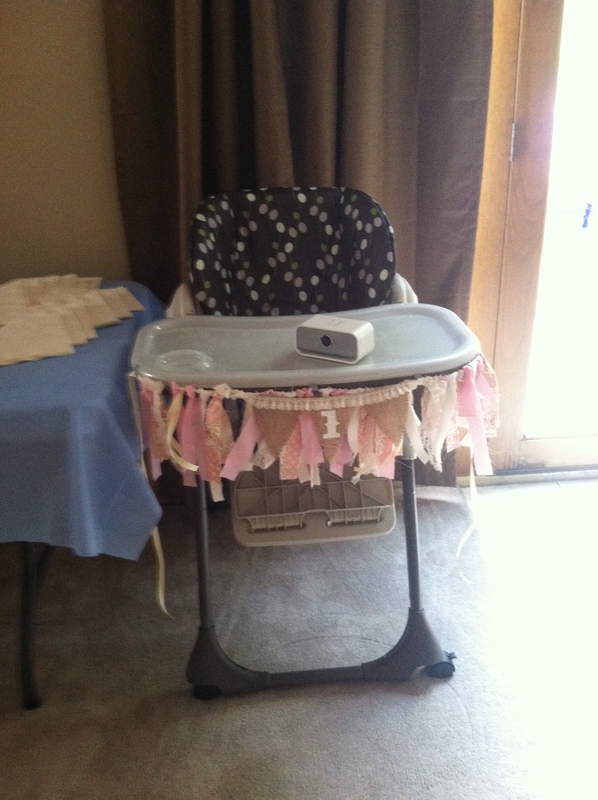 We did not follow any kind of pattern and just kind of winged it! Keep the strands pretty tight together, you want it to look nice and full. 3. 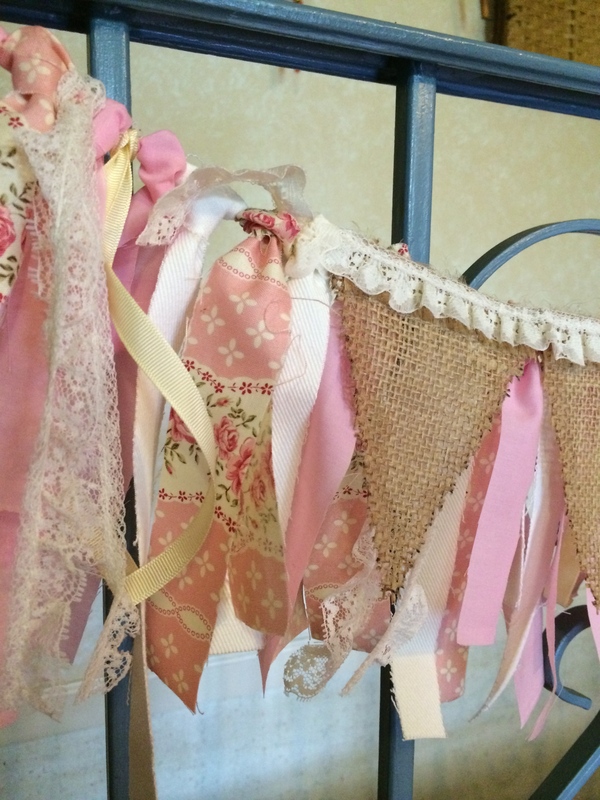 Once you have all your fabric strips on there, start randomly adding strings of lace trim and ribbon. 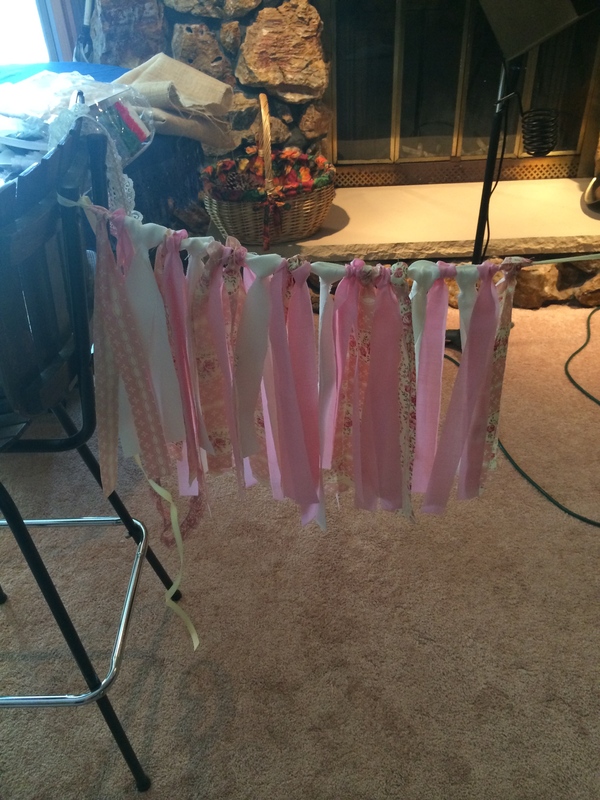 We had lots of lace trim with varying widths and colors so we just threw it all in there. 4. 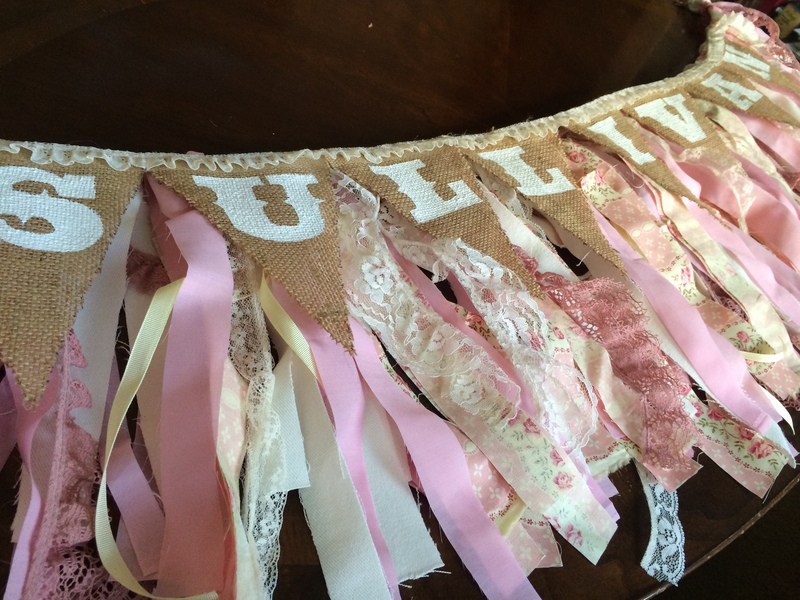 Now it’s time for the burlap! Cut a triangle out of paper and use it as a stencil. 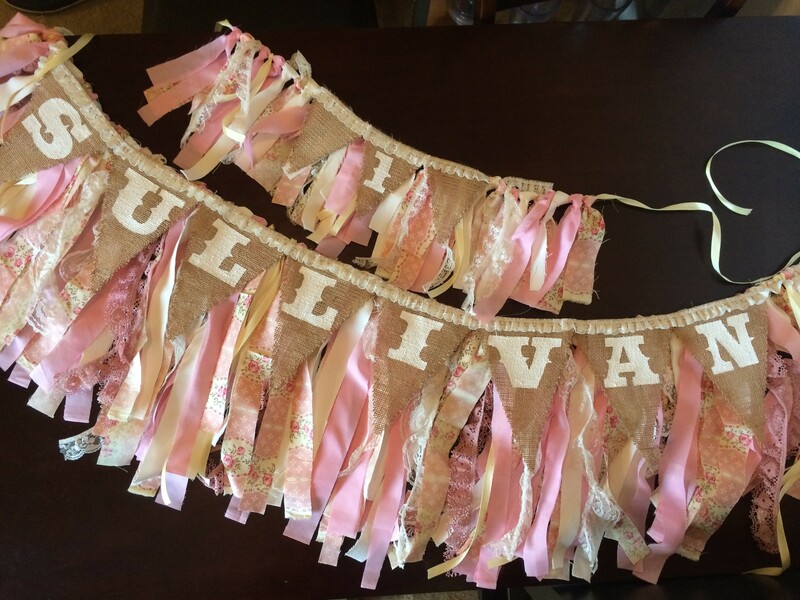 Cut out a burlap triangle for each letter of the name. You might notice that the edges tend to unravel. We didn’t want that to happen. So we mixed a little Elmer’s glue with a little water and painted the edges. The glue dries clear and hard to keep our edges nice and clean! Then sew the triangles to the lace trim. And then you’ll end up with a little something like this! 5. And now it’s time to get painting! Type the name of the child into Word, print it out, cut out the letters, and use them as a stencil. I downloaded a font called Saddlebag for free here. 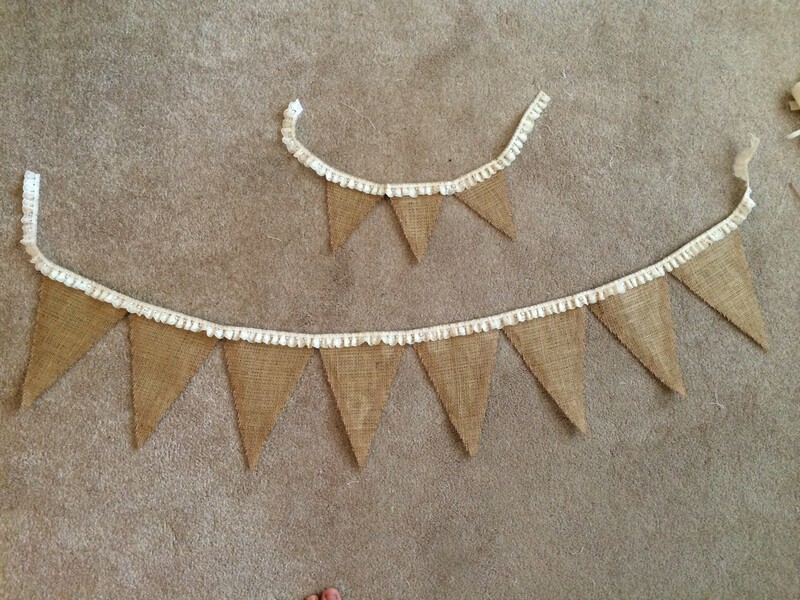 I used a white fabric paint and used 3 coats, trying to fill in all the holes in the burlap. Be sure you have something under the burlap because the paint will seep through. 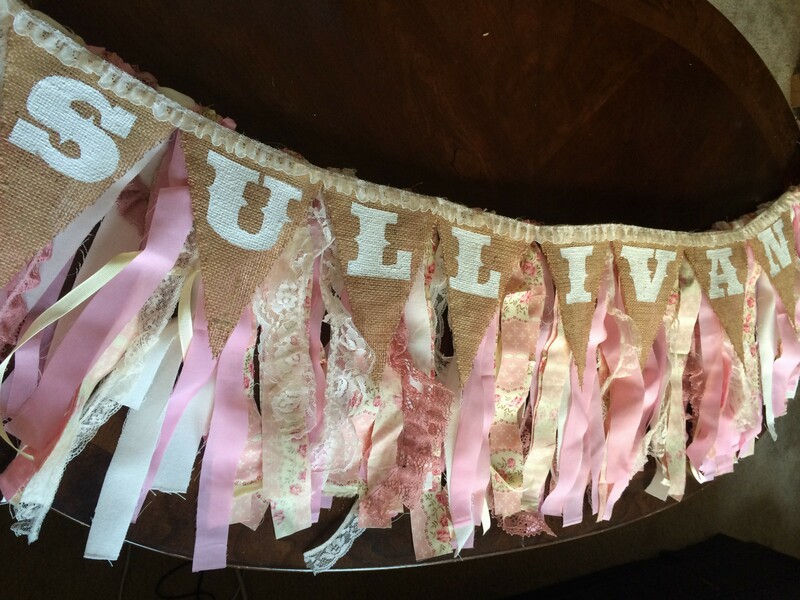 And because I love Sully Baby Girl, I made her a bonus banner too by “halving the recipe” to make a mini banner! Add cake and enjoy! 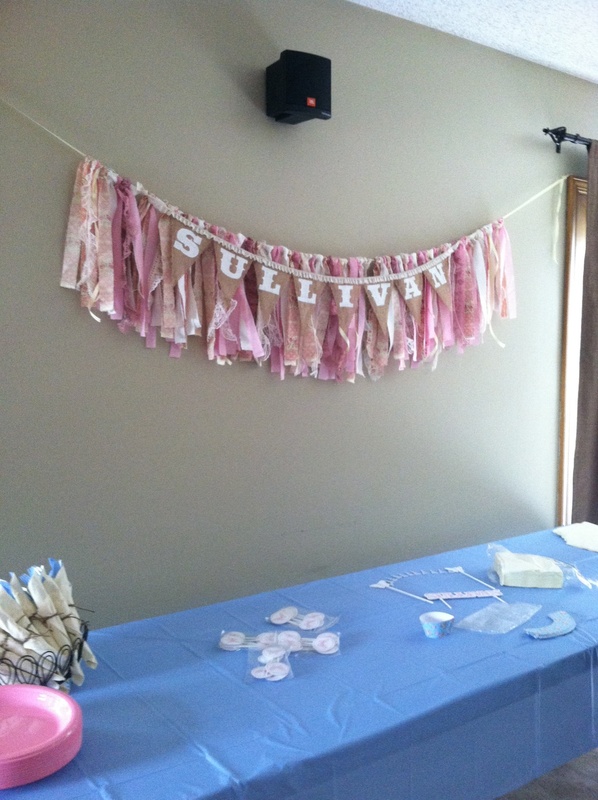 Happy Birthday, Sullivan!!! P.S. 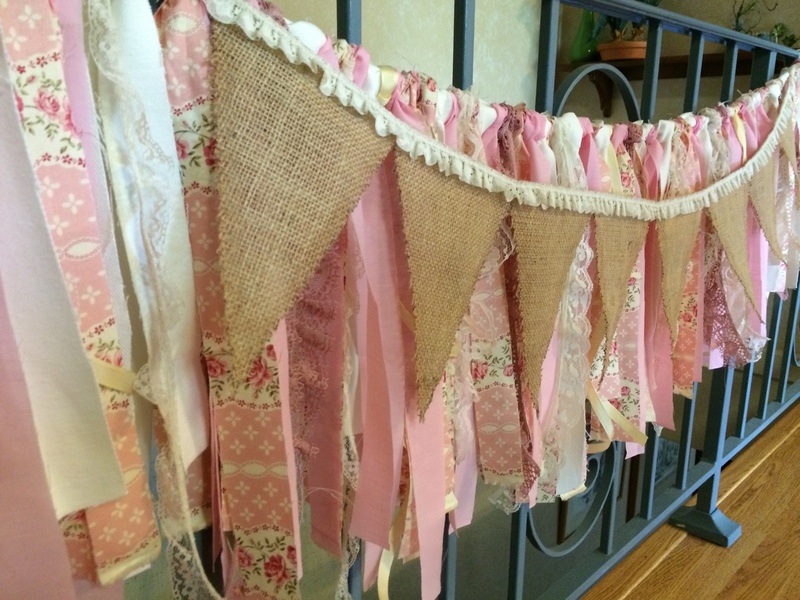 This project sparked my recent love of burlap! 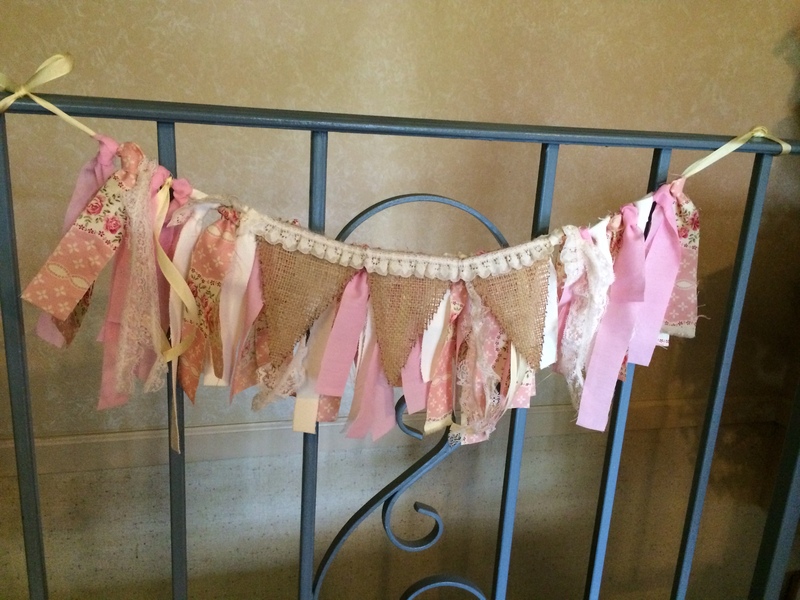 Especially the lace/burlap combo! Much more of that to come I’m sure.